12.07.2004 - Raccoons are excellent climbers. They are very strong, they have very nimble hands, and they can actually swivel their hind feet 180 degrees, allowing them excellent grip and the rare ability to descend a tree (or a wall, downspout, or screened-in pool such as seen above) headfirst. Thus, raccoons commonly crawl on the roofs of homes. 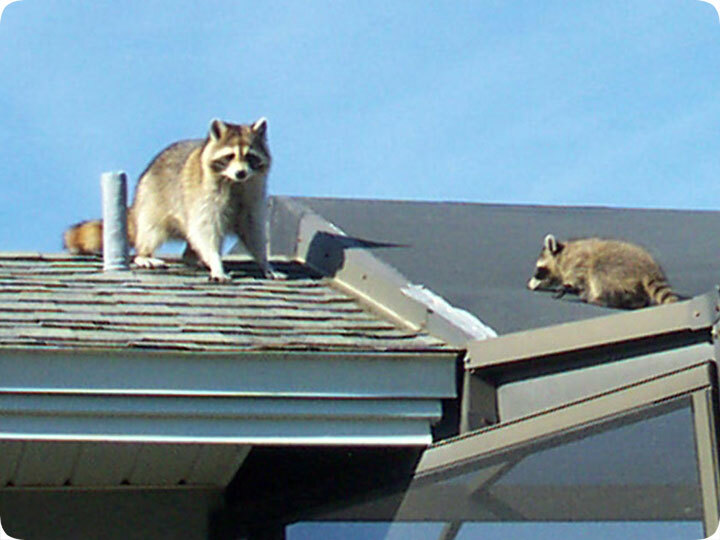 Raccoons go on roofs for many reasons. They often crawl up there for a safe place to spend the night. Some people call me simply to report sleeping raccoons on top of houses. Other times, they may crawl just for the heck of it. I've worked at some homes at which the homeowner has been woken up every night by raccoons parading about on top of her roof for no apparent reason. Most of the times, the reason a racoon is on the roof is because it's torn its way into the attic, and it's en route to its home. That was the case in this photo. I was at this house today because the homeowners have been hearing a lot of noise in the attic. They thought that perhaps the noise was on the roof, but it's hard for the sound to translate through on most architecture. The raccoons happened to be outside when I arrived, and the mother raccoon was taking its ten-week-old young out for an exploratory walk. I took the above photo as the mother raccoon anxiously awaited its baby to reach her. They eventually disappeared. I inspected the roof, and sure enough, I found that she'd torn a hole in one of the eaves and was going into the attic. I went inside the attic and found the nest of young. She took off while I removed the three young raccoons. I then out them in a special holding cage in the back of a trap and set it on the roof. I sat at a far distance on another portion of the roof and watched as the babies cried for their mother. Sure enough, she came out. After a long time of apprehension and sniffing the outside of the trap, she went in to try to get her young, and I caught her. I removed them all off the roof, fixed the entry hole, and drove off to relocate them far away. The job was finished in one trip!